Afraid toddler gymnastics classes will leave you broke? Did you know many of the toddler teachers at gyms actually have no (or very little) gymnastics background? Gymnastics classes for toddlers are hard enough to come by, but those that are high quality and affordable are nearly non-existent. If you are lucky enough to find a great class near you, fabulous! If not, no need to deprive them of the many benefits that gymnastics provides for children! It’s super easy and fun to start these activities for toddlers at home! Your child can learn gymnastics at home, and the toddler activities below are the same as kids learn in a typical preschool gymnastics class. 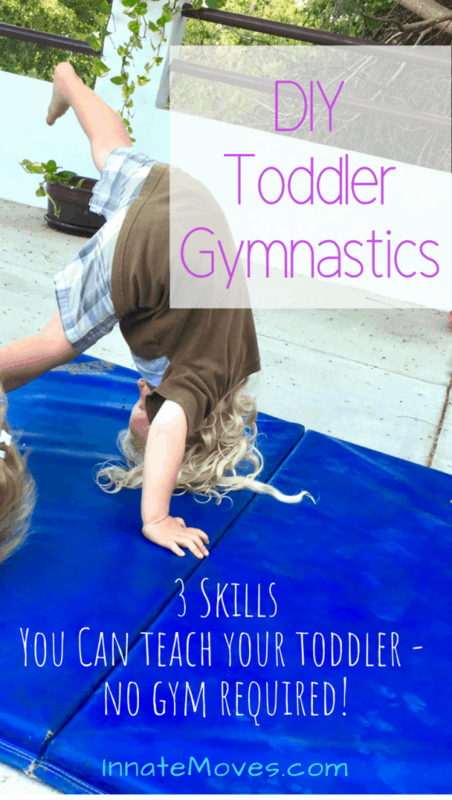 If you’re not into helping your child learn gymnastics – never fear! Check out my Preschool Gymnastics Course so your little one can start learning with me online today! Sign up for the email list and I’ll send you info how to enroll right away! Gymnastics mats and kids gymnastics equipment can make toddler activities more fun and exciting, but they should not substitute for plenty of outside time and are not necessary at all. All your toddler needs is you to be engaging and the toddler gymnastics skills below will be activities your child will want to do with you! Have your toddler start lying on their back (supine position) with their legs straight and together and arms straight above their head. Encourage them to roll over to their stomach and keep going back to their back. With young toddlers or babies ,you can start with partner log rolls. Lay on your back and hold your child on your chest. As you roll, form a ‘cage’ for your child with your arms so you roll on your elbows, not them! Try to keep a tight body! Create obstacles, like towels, to roll over! Start on the end of a sheet or towel, help child bring the edge of it with them as rolling, so they’re rolling up like a burrito. Then, lift the end of the sheet/towel so they roll quickly down and off! Go slow your first times and make sure to do it on a bed or something with padding! Show your toddler what to do by putting your hands on the floor and jumping slightly while keeping arms straight. Stress straight arms. When they jump, weight is quickly transferred to their arms, often causing them to bend and land on their head. Practice on a soft surface until they are used to the feeling of straight arms. Keep looking at the ground to help prevent them from crashing to head or rolling. Add a loud “hee-haw” with your donkey kick! Use a folded gymnastics mat or other raised stable surface to put hands on when donkey kicking. This will create much more power so be careful when returning to a flat surface. Instead of jumping with both feet, leave one foot in the air (it’s a donkey with a sore leg!) and hop on the other. This is the next progression for a handstand. Have toddler put hands on floor in front of him/her. Tell them to look at their belly (or glue their chin to their chest), which will tuck their head under. Gently lift their hips over (do NOT push them over) and on to their back for the roll. You may have to put one hand on the back of their head to keep head tucked, while grasping around their waist with the other arm and helping them roll that way. Do not try to get them to roll without a tucked head (chin to chest) position, it can injure their neck! Many kids will untuck and straighten out when you begin initiating the roll. This is a normal response to their body going in a position it’s not used to. Ease into it. They can begin initiating the roll on their own around one year. For most toddlers it will take much longer for them to push themselves over. You can try this on a hill or a cheese mat to help. For toddlers that are apprehensive about rolling over, let them stand in the beginning position (hands on ground in front, tucked head) with their head on the floor, swaying back and forth. You can do the above skills as much as your toddler likes to at home. In addition to the listed benefits, gymnastics will help their overall gross motor development. The best part is it’s so much fun! Also check out more activities for babies and toddlers and for kid’s gymnastics at home. You really don’t need a fancy gym to encourage your child to learn gymnastics!